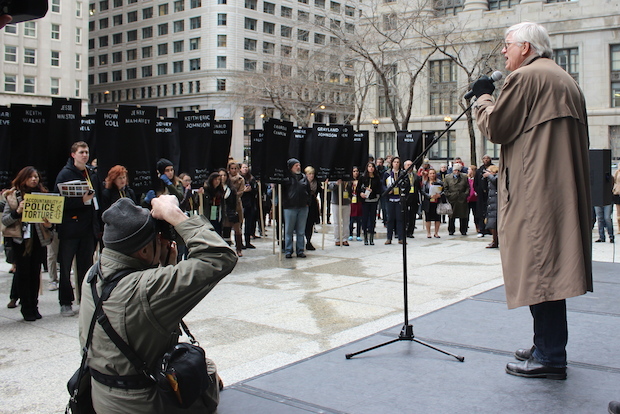 THE LOOP — Hundreds of Amnesty International protesters rallied in Daley Plaza Friday to demand reparations for police torture victims of notorious Jon Burge, but the aldermen sponsoring a reparations ordinance were not among them. About 200 protesters marched to Daley Plaza from the JW Marriott in the Loop, where Amnesty International USA is holding its annual general meeting this weekend. They carried banners bearing the names of the estimated 118 people tortured by Police Cmdr. Burge and his “midnight crew” from the ’70s into the ’80s. The city has paid Burge’s victims an estimated $57 million. “This scandal will not end until all the men receive reparations for the torture,” said G. Flint Taylor of the People’s Law Office, one of the leading attorneys in the torture cases. 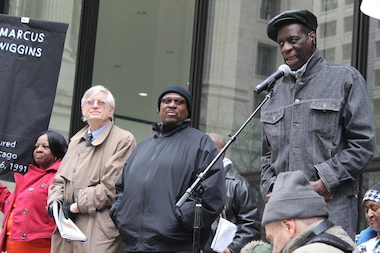 “People power is gonna keep this issue alive,” added Darrell Cannon, a Burge torture victim. Protesters backed the reparations ordinance sponsored last year by Aldermen Howard Brookins Jr. (21st) and Joe Moreno (1st). It calls for the city to issue a formal apology to victims and create a $20 million fund for compensation, including medical and psychological treatment as well as vocational training and City College education, and for the subject to be taught in Chicago Public Schools. Yet Brookins and Moreno did not attend the rally. Brookins said he was unaware of the rally, but welcomed the support. The proposed ordinance has been on the Finance Committee agenda over the last few months, but has been deferred when Brookins, the sponsoring alderman, didn’t show up. He has kept a low profile at City Hall since his chief of staff was charged with bribery in February following a federal sting. Joey Mogul, of the People’s Law Office, said Brookins’ commitment had not flagged. Brookins said he expected the subject to be on the committee agenda before the May City Council meeting.